Beards are now as popular as they are rare. But whoever decides for this form of facial hair must realize that only a well-groomed beard is a beautiful beard. Knots and dead skin particles in the beard are an absolute no-go and should therefore be avoided as much as possible. 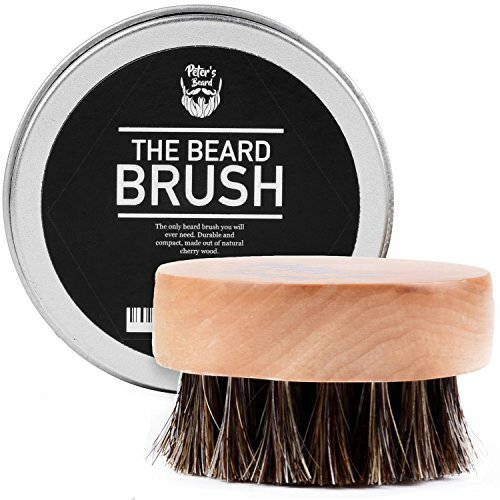 Wooden brushes from Peters Beard enable you to maintain a well-maintained exterior at all times. Your Beard is perfectly styled and shaped by combing with our beard brush. The care products of Golddachs or Blackbeards are optimally integrated, while the simultaneous skin massage stimulates the blood flow and thus also the beard growth. Through the continuous care with Peter's Beard beard brush you can always present your combed and well maintained beard. The brush is the perfect alternative to the classic comb. It has a practical Oak handle, which makes it particularly convenient and provides comfortable combing. As high-quality wood was used, which not only visually convinces, but also is very solid. The horse hair bristles are robust and promise a long and effective period of use. With the beard brush from Peter's Beard, you choose for an all-natural product. A nice metal box accompanies the brush and makes it not only a popular accessory in the face care for the gentleman, but also protects it from damage by external influences. Due to the appealing exterior of the box, the set is ideal as a gift. Buy Peter's Beard Brush now and enjoy a top styled beard!